« Do You Know the Signs of a Heart Attack in Women? So not that long ago I was sitting on the couch with my family watching Unwrapped on the Food Network and I got a major case of the munchies. (I should know better than to watch food TV hungry…almost as bad as shopping hungry.) They were making English Toffee at a factory followed by delicious popcorn balls…mouth still watering. 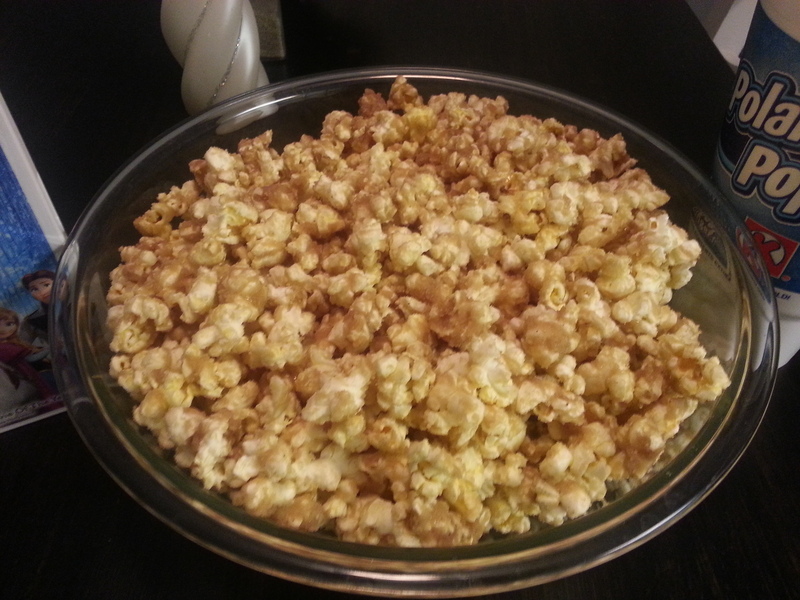 I wanted both so I invented my version of English toffee popcorn. Its been very popular. I LOVE making candy so I added a bit of this and bit of that, heated it up and slathered the popcorn. Then someone did the unthinkable…they ask for the recipe and well let’s just say that a bit of this and a bit of that wasn’t really cutting it. So I thought I would share my Monday Munchie with you as well. I promises it super easy AND super yummy. I bet you even have all or most of the ingredients as staples in your pantry! First you are going to microwave the two bags of popcorn. Let them cool. Gently pour them into a large bowl being sure to filter out the kernels. One way is to hold the bag on the side and scoop the popcorn out slowly. As the bag gets less full, gently shake the bag in an upright position to force the kernels to the bottom. Continue scooping out the popcorn. You may not get them all out but your teeth will thank you for getting a lot of them out. Set this bowl of popcorn near your cooktop as you will need quick access to it later. 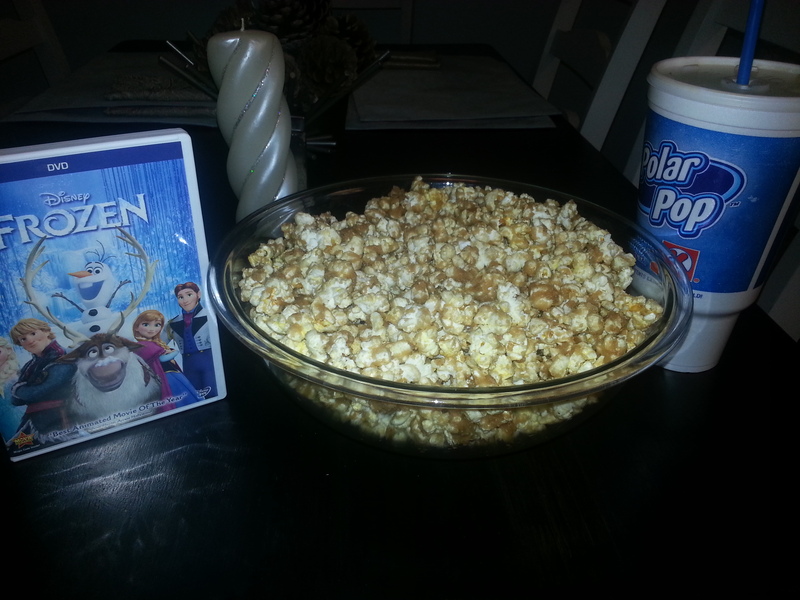 Make sure to separate the kernels from the popcorn or you may find it too hard for your teeth. Grab a large stock pot or Dutch oven pot that is large enough to hold two bags of popcorn. 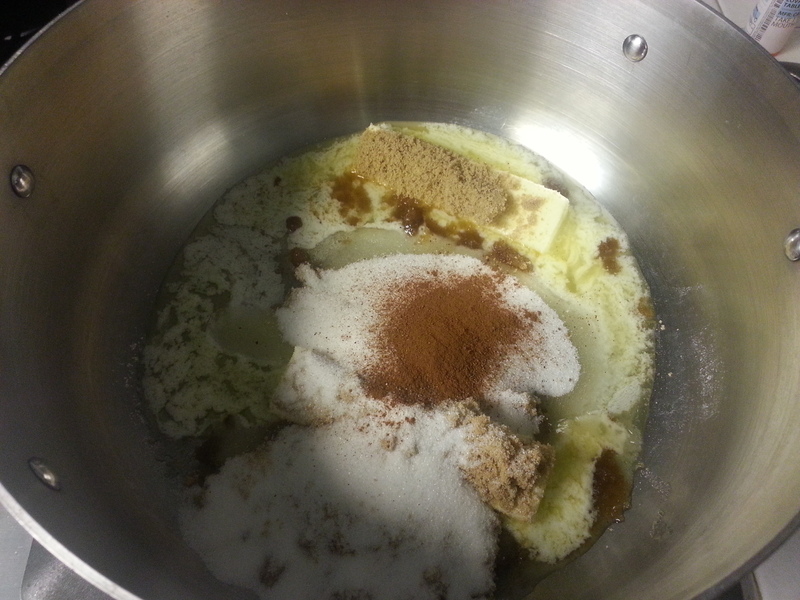 In the stock pot, add white sugar, brown sugar, butter, nutmeg, and cinnamon. Heat over a medium heat stirring constantly with a wooden spoon so the sugar does not burn. You will want to make sure you use a large enough pot to hold two bags of popcorn. Continue to cook until all sugar has been melted, so no granules are left and all the butter has been blended into sugar mixture. 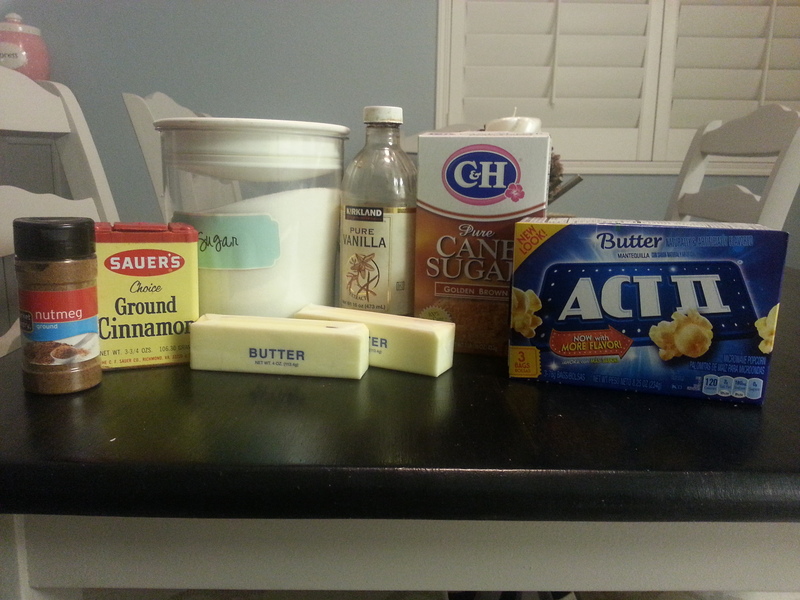 If there is a thinner liquid still in the mixture, the butter has not been fully incorporated. 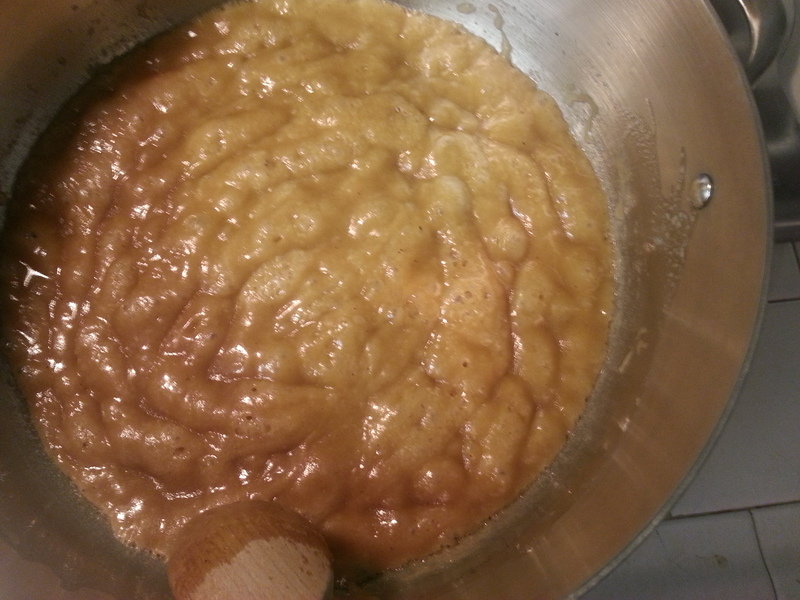 This should look like a blanket of caramel colored thick syrup and it should be bubbling. It should lift itself off the bottom of the pot when stirring. It should be to soft candy/chews on a candy thermometer and I recommend investing in a good candy thermometer. Make sure all the sugar and butter is well incorporated and the granules have melted. If your candy thermometer is at soft candy/chew, then you are ready to add vanilla. Add vanilla. Continue stirring until well combined and fully incorporated. It should have a rolling boil by now. The mixture will get thicker and darker in color. 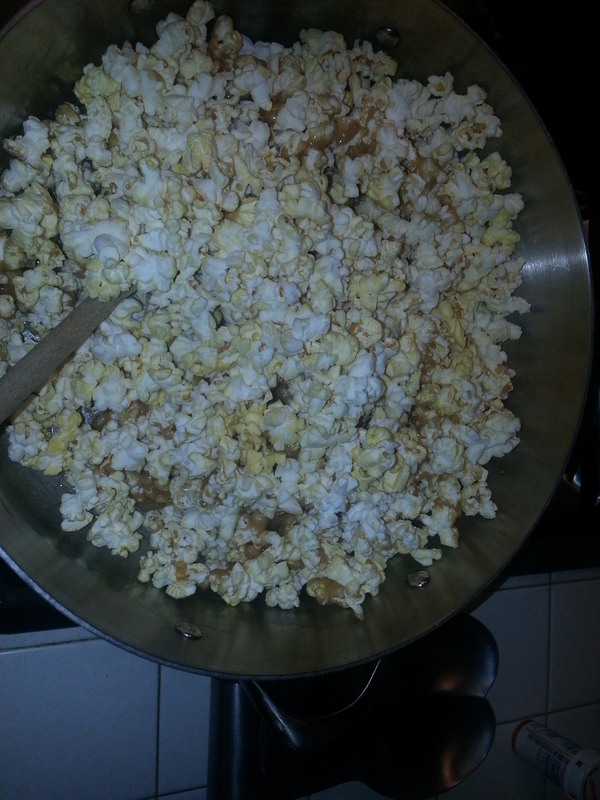 Turn off the heat and add half of the popcorn into the mixture. 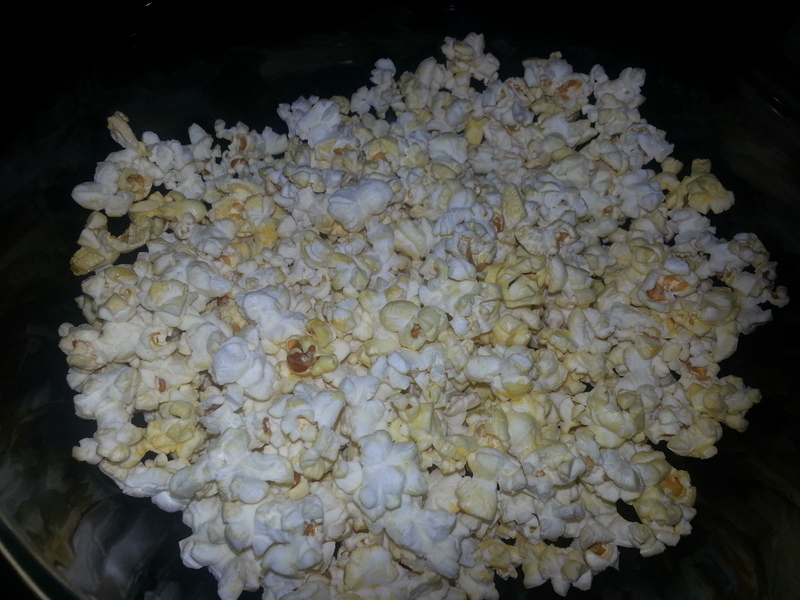 Stir by turning the popcorn into the sugar mixture until all the popcorn is coated. Repeat with the other half of the popcorn. Once finished coating the popcorn with the mixture, spread it out on a cookie sheet to cool and prevent all the popcorn from sticking together. It will need to cool about an hour but as long as you are careful with the sugar, I can say sampling is awesome. Add one half of the popcorn and mix. Then the other but do it fast or the sugar will cool. Lastly, put on your favorite movie, grab a drink and enjoy your popcorn. Grab a drink, and a movie and munch!